Presbyterianism is mainly founded on the theology of John Calvin, of the sixteenth century, although current Presbyterian beliefs do not coincide exactly with his doctrine. Presbyterianism ascribes to the belief in predestination. According to this belief, some people have already been chosen by God to definitely be saved. These people are called the "elect." Everyone else's fate has not been chosen. This is not to be confused with Calvin's original doctrine of what is called double predestination, according to which God had already chosen the fate of everyone for all eternity, either salvation or damnation. Since Calvin greatly emphasized that there should be no images of God or Christ, most Presbyterian churches, especially the older buildings, will have absolutely no decorations of the sort. In the 19th century, some branches of Presbyterianism began moving away from that insistence a little, so that some churches may now have newer decorations such as stained glass windows, but they still will not be very prominent or emphasized in the decoration. 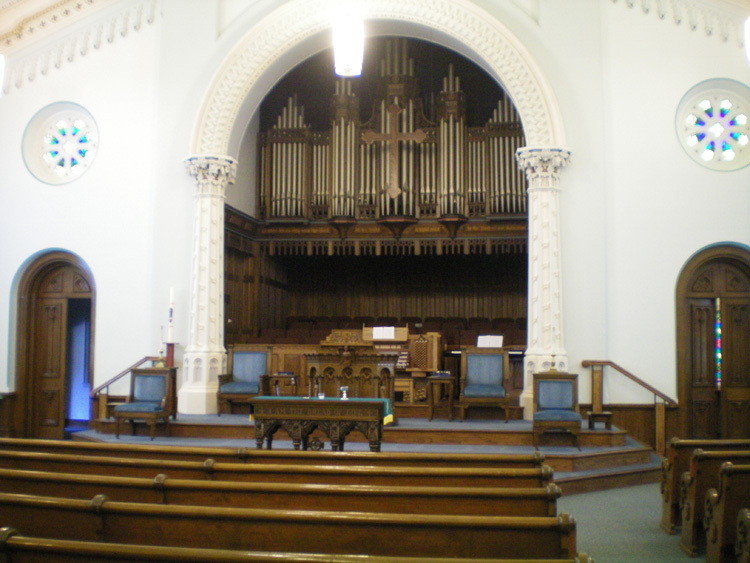 In Presbyterian churches, as in most other Protestant churches, the table for communion is at the front of the chancel, but above it, in the center and much more prominent, is the pulpit. The placement of the pulpit deliberately draws more attention, showing that preaching the Word of God is the central focus of the church. The congregation was formed in the 1760s, but the present church was not built until 1861, after the previous building's roof caved in. The cemetery in the church yard includes the grave of Colonel James Smith, a signer of the Declaration of Independence and Colonel in the Revolutionary Army. While the church originally had no decorations depicting Christ, three stained glass windows in the back were added later, one of which shows Jesus teaching. The rest of the original windows remain, which are of flowers. The cross above the choir section is also a recent addition, less than 10 years old. 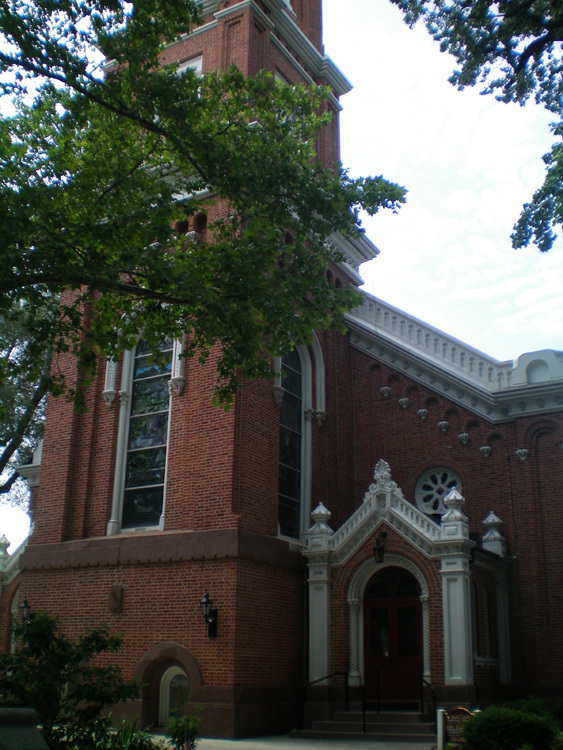 A cross hangs at the front of the First Presbyterian Church of York. It was added ten years ago. 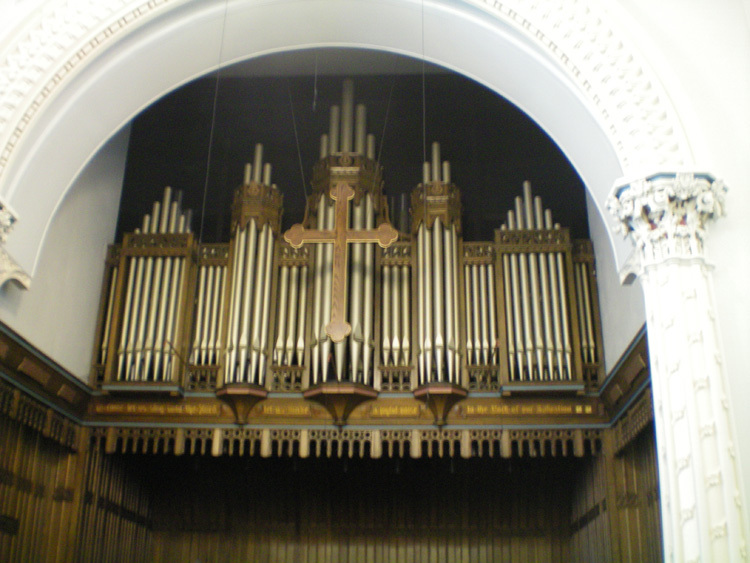 The interior of First Presbyterian Church of York.